IN Dylan Thomas’s radio drama Under Milk Wood, Polly Garter exclaims “Oh, isn’t life a terrible thing, thank God.” How true this is for Eilis Lacey, emigrating from Ireland to Brooklyn, New York. As for so many of her generation, however, building a new life in the promised land of America was a bittersweet affair. In John Crowley’s beautifully paced film, based on Colm Tóibín’s novel of the same name, Eilis is played with conviction and reserve by Saoirse Ronan, who commands the screen for nearly two hours. Eilis is radiant, convincingly undaunted by whatever tribulations that beset her. Nick Hornby’s sharp and often very funny script keeps those challenges bracingly emotional rather than melodramatic. He never cheats us with predictable conflicts; the story draws us in with its patience and unhurried pace. Ronan’s luminous blue eyes and gentle command of the character tugs at our hearts. This is one of the year’s best collaborations of writing, directing, and performance. With the encouragement of a loving and supportive sister Rose (Fiona Glascott) and the financial help of Father Flood, played with gentle authority by Jim Broadbent, Eilis leaves behind her widowed mother (Jane Brennan) to build a life among many other newly displaced Irish immigrants. She rooms in a Brooklyn boardinghouse with a nicely cast gaggle of gossiping Irish girls (Eve Macklin, Emily Bett Rickards, Nora-Jane Noone). Their stern but patient landlady, Mrs. Madge Kehoe, knows the wiles and ways of these young women and holds them in check. As Kehoe, stalwart Julie Walters finds just the right balance of impatience and whimsy. The young women gather regularly for lively dinners, and the veteran has plenty of advice for each: “A giddy girl is the eighth deadly sin,” she informs them as they giggle their way through the latest news. She also recognizes the resilience and promise that distinguishes Eilis; she is the only one who volunteers to feed homeless Irish men at Christmas time, a chore the others find distasteful. In a beautifully constructed scene, Eilis dishes out food with Father Flood at a soup kitchen. “These are the men that built the bridges and tunnels,” he sadly explains. “God knows what they live on now.” One of the younger men, a glorious Irish tenor, stands up and sings. (The singer is the gifted Iarla Ó Lionáird, the song is “Casadh an tSúgáin.”) All conversation ceases. The camera intently surveys the lost faces of the workers who labored to build the city. It is a riveting moment. The song continues to soar as the next scene begins; one example, of many, of the film’s expert use of fluid emotional transitions. The movie hums along without jolts or jitters. Eilis will fall in love and then find herself challenged by twists of fate that strengthen her resolve. People are decent, funny, and caring. Humor and melancholy are smartly calibrated; emotional moments are allowed to simmer. The only girl enrolled in a college bookkeeping class, Ellis imagines a new life, falls unexpectedly in love, and aches for family and homeland. The gentlemen she falls in love with, Tony (Emory Cohen, channeling Marlon Brando) and Jim (Domhnall Gleeson, the suave son of Brendan Gleeson), bring out her best qualities: kindness, empathy, and bourgeoning self-confidence. Jessica Paré is cast as the cold and professional manager (who hides a kind heart) at the department store where Eilis works. Smart cameo performances color the landscape: Eva Birthistle, as a worldly wise fellow traveler full of salty advice, and James DiGiacomo, as Tony’s comically outspoken little brother, are outstanding. 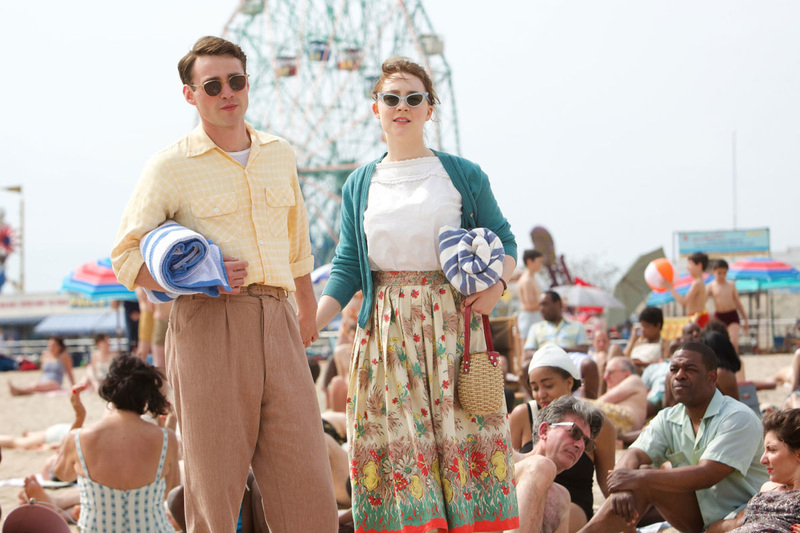 Brooklyn is a sentimental portrait of the Irish immigrant experience. The script neatly consolidates the book’s trials and tribulations without becoming too saccharine. The story moves along with dispatch thanks to Hornby’s concise script and Crowley’s evenhanded direction. The camera knows when to keep back, when to move in, and when to linger on a compelling close-up. The music clues the audience into the emotional climate of each scene, though sometimes Michael Brook’s (Into the Wild, The Fighter) plaintive Irish-tinged soundtrack becomes bullying. Brooklyn‘s merit is that it stays true to the hearts and minds of its immigrant characters: Saoirse Ronan’s face is allowed to tell the story.